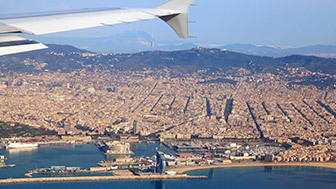 At the foot of the Collserola range, the Horta-Guinardó district is a fantastic viewpoint overlooking the city. It has always been fertile and enjoyed an abundance of water, with even economic activities related to this liquid feature. The old masies, or farmhouses, and its green spaces are a precious, living reflection of this wealth. 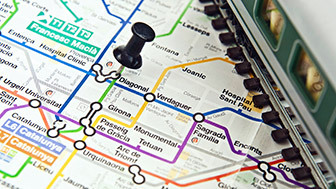 Zigzagging between valleys and hills in the northeast of the city, and stepping into the Collserola range, the Horta-Guinardó district is the third largest in Barcelona. An area with a rural past and abundant vegetation, it provides some surprising views from the many viewpoints in its neighbourhoods, like those of the Tres Turons hills. 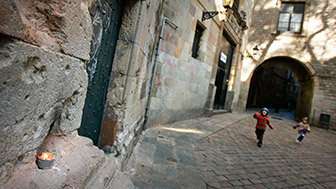 Its thousand-year history, represented by the Sant Genís dels Agudells neighbourhood and its Romanesque church, includes the surroundings of the old rural centre of Horta, which extended into the present-day Vall d’Hebron, formerly known as the Vall d’Horta, and gradually integrated all of the 11 neighbourhoods that make up the district. Far from the city's main hub, the industrial and population growth of Horta-Guinardó was slow and, traditionally, closely linked to the abundance of water in the area, to the extent that, at the beginning of the 20th century, the old part of today's Horta neighbourhood was renowned for its cottage industry of washerwomen. Another example of this water-based economic activity was the distribution and sale of water from the Font d’en Fargues, famous at the turn of the 20th century. 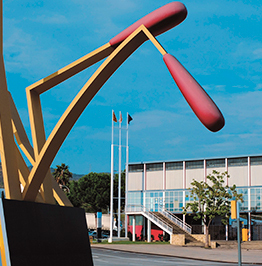 The massive industrialisation in Barcelona at the end of the 19th century did not reach Horta until the 1950s, and throughout this time the area maintained the independent, rural character which it still has today. One example of this is the Clota neighbourhood, which its characteristically agricultural appearance. Thanks to this, and the pride of its residents, some of the farmhouses and great mansions from the time, like Can Cortada, Can Fargas, Can Soler and Can Baró, are still standing, transformed into spaces with a variety of different uses. Today, Horta's old quarter, with its little streets and village-like feel as well as its Modernista extension, is one of the liveliest and most commercial neighbourhoods in the district. Other, working-class neighbourhoods which make up a unique group are El Carmel, Can Baró and La Teixonera. Located in the Turó del Carmel foothills, they have a simple, working-class atmosphere provided by the locals, as well as the families who arrived from all over Spain after the war: little houses lined up along steep streets, little squares with bars and green parks full of life, among which the well-known Turó de la Rovira viewpoint, from where you can get one of the best 360º vistas of the city, stands out. Higher up, on Passeig de la Vall d’Hebron, touching Montbau, is one of the most important of Horta-Guinardó's treasures: the Laberint d’Horta, a natural retreat and a historically important location in Barcelona, and no wonder, as it was the city's first park, created in the 18th century. Guinardó and Baix Guinardó, located at the lowest point of the district, were previously part of the village of Sant Martí. They are fertile neighbourhoods, with a history full of very interesting episodes, including, for example, the role played by Mas Guinardó in the events of 1714. We are talking about an area of outstanding green spaces, parks like the magnificent Parc de les Aigües, that of Príncep de Girona and the one in Guinardó, and gardens, like the Jardins de Frederica Montseny. As mentioned before, in Horta-Guinardó there are reminders of a not-so-distant rural past: little houses, narrow streets, parks, farmhouses and residents who live outside the hustle and bustle of the rest of the city, people who, from their lofty heights, can afford to look down on the other Barcelona residents. No results were found for your search. Please change your filters or search criteria and try again. Formerly a village separate from the city, the Horta neighbourhood preserves its splendid old quarter, made up of little squares and small streets, where life still goes on at a village pace. 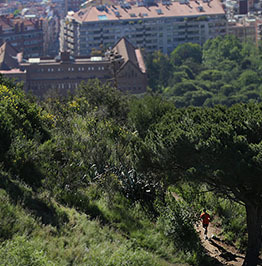 The Collserola range, part of Barcelona's metropolitan area, is the green lung on the edge of the city and a place of recreation for all those who enjoy nature. 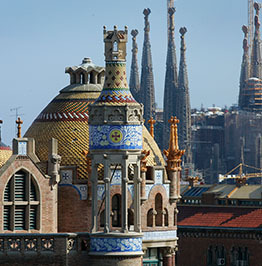 Hospital de Sant Pau, one of the most important health centres in Barcelona, immensely important for Catalan Modernisme. 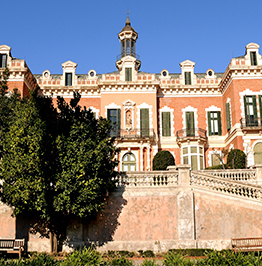 The Laberint d’Horta Park is the oldest park in Barcelona and, in addition to being a historical space, a nature area where you can enjoy landscape gardening in all its splendour. A symbol of pacifism and the anti-war movement, the Pavelló de la República is a replica of the Pavilion of the Spanish Republic which was built for the Universal Exposition in Paris in 1937. 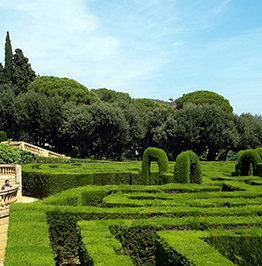 Palm trees, magnolias, cypress and holm oaks, surrounding a French château-style palace, can be found in the Palau de les Heures gardens, offering visitors a romantic walk. Hidden away off the beaten tourist track, down little side streets, there are genuine.